The selection below from the book The Dialogue has a unique pedigree. 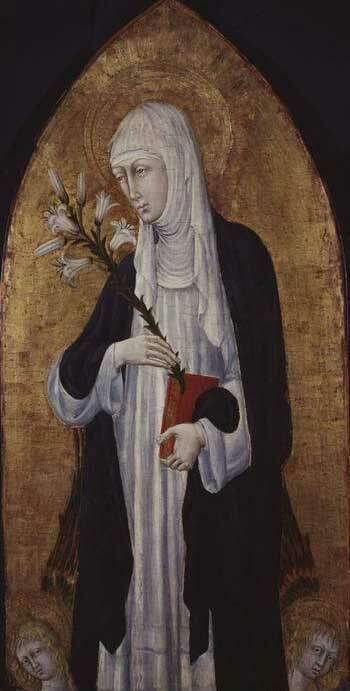 While the famous mystic and doctor of the Church St. Catherine of Siena is listed as its author, one could say, as is often done by publishers nowadays, that it was written by “God the Father, as told to St. Catherine of Siena”. Born into a very large family in 1347, this beautiful woman felt a calling not for marriage as her parents would have liked, but rather for the religious life. She started receiving mystical visions from God at an early age and spent much time in prayer, penance, and fasting before becoming a Dominican tertiary (an associate of the Dominican order) in her teens. As such, she continued to experience visions, as well as trials and temptations, and at times she felt God had abandoned her. Yet, as He later related to her, He was doing this to increase her Holiness, fortifying her by grace. After this probationary period of isolation, Catherine attracted many friends and associates whom she often helped on their spiritual journeys. She also volunteered to help many of those suffering from terrible diseases, such as the plague, in Siena’s hospitals. Catherine was known far and wide, both in her hometown of Siena and throughout Italy, as a peacemaker, a counselor, and a worker of miracles. At a time when the Papacy was located in Avignon, France rather than its traditional home in Rome, St. Catherine was instrumental in persuading Pope Gregory XI to return to Rome in January 1377. Ecclesiastical tensions between France and Italy continued, however. The Great Schism (which lasted almost 40 years in which there were two successive papal claimants at a time) broke out on in 1378 upon Pope Gregory’s death with a pope in Rome (Urban VI, Gregory’s successor) and an antipope Clement VII, (invalidly elected) in Avignon. Catherine took up residence in Rome in November 1378, upon being summoned there and remained in Rome working tirelessly on behalf of Pope Urban, the poor, and the church, until she passed away in 1380 after a prolonged illness. The Dialogue (which Catherine referred to simply as “my book”) was written in 1377-78 as a Divine response from God to 4 petitions Catherine posed to Him concerning 1) herself; 2) the reform of the Church; 3) the whole world, especially for peace among rebellious Christians; 4) and Divine Providence, both in general and regarding a specific case. St. Catherine dictated much of the book while in ecstasy, that is to say in a mystical state, although she also edited many sections of this work as well. In this excerpt from the Dialogue reprinted below, God the Father gives us His views on prayer, particularly on the importance of mental prayer as well as vocal prayer. He sums up what mental prayer entails quite nicely and succinctly. "When the soul has passed through the doctrine of Christ crucified, with true love of virtue and hatred of vice, and has arrived at the house of self-knowledge and entered therein, she remains, with her door barred, in watching and constant prayer, separated entirely from the consolations of the world. Why does she thus shut herself in? She does so from fear, knowing her own imperfections, and also from the desire, which she has, of arriving at pure and generous love. And because she sees and knows well that in no other way can she arrive thereat, she waits, with a lively faith for My arrival, through increase of grace in her. How is a lively faith to be recognized? By perseverance in virtue, and by the fact that the soul never turns back for anything, whatever it be, nor rises from holy prayer, for any reason except (note well) for obedience or charity's sake. For no other reason ought she to leave off prayer, for, during the time ordained for prayer, the Devil is wont to arrive in the soul, causing much more conflict and trouble than when the soul is not occupied in prayer. This he does in order that holy prayer may become tedious to the soul, tempting her often with these words: 'This prayer avails you nothing, for you need attend to nothing except your vocal prayers.' He acts thus in order that, becoming wearied and confused in mind, she may abandon the exercise of prayer, which is a weapon with which the soul can defend herself from every adversary, if grasped with the hand of love, by the arm of free choice in the light of the Holy Faith." "Know, dearest daughter, how, by humble, continual, and faithful prayer, the soul acquires, with time and perseverance, every virtue. Wherefore should she persevere and never abandon prayer, either through the illusion of the Devil or her own fragility, that is to say, either on account of any thought or movement coming from her own body, or of the words of any creature. The Devil often places himself upon the tongues of creatures, causing them to chatter nonsensically, with the purpose of preventing the prayer of the soul. All of this she should pass by, by means of the virtue of perseverance. But if you ask Me, whether the soul should abandon vocal prayer, since it does not seem to all that they are called to mental prayer, I should reply 'No.' The soul should advance by degrees, and I know well that, just as the soul is at first imperfect and afterwards perfect, so also is it with her prayer. She should nevertheless continue in vocal prayer, while she is yet imperfect, so as not to fall into idleness. But she should not say her vocal prayers without joining them to mental prayer, that is to say, that while she is reciting, she should endeavor to elevate her mind in My love, with the consideration of her own defects and of the Blood of My only-begotten Son, wherein she finds the breadth of My charity and the remission of her sins. And this she should do, so that self-knowledge and the consideration of her own defects should make her recognize My goodness in herself and continue her exercises with true humility. I do not wish defects to be considered in particular, but in general, so that the mind may not be contaminated by the remembrance of particular and hideous sins. But, as I said, I do not wish the soul to consider her sins, either in general or in particular, without also remembering the Blood and the broadness of My mercy, for fear that otherwise she should be brought to confusion. And together with confusion would come the Devil, who has caused it, under color of contrition and displeasure of sin, and so she would arrive at eternal damnation, not only on account of her confusion, but also through the despair which would come to her, because she did not seize the arm of My mercy. This is one of the subtle devices with which the Devil deludes My servants, and, in order to escape from his deceit, and to be pleasing to Me, you must enlarge your hearts and affections in My boundless mercy, with true humility. You know that the pride of the Devil cannot resist the humble mind, nor can any confusion of spirit be greater than the broadness of My good mercy, if the soul will only truly hope therein. The soul, therefore, should season the knowledge of herself with the knowledge of My goodness, and then vocal prayer will be of use to the soul who makes it, and pleasing to Me, and she will arrive, from the vocal imperfect prayer, exercised with perseverance, at perfect mental prayer; but if she simply aims at completing her tale, and, for vocal abandons mental prayer, she will never arrive at it. Sometimes the soul will be so ignorant that, having resolved to say so many prayers vocally, and I, visiting her mind sometimes in one way, and sometimes in another, in a flash of self-knowledge or of contrition for sin, sometimes in the broadness of My charity, and sometimes by placing before her mind, in diverse ways, according to My pleasure and the desire of the soul, the presence of My Truth, she (the soul), in order to complete her tale, will abandon My visitation, that she feels, as it were, by conscience, rather than abandon that which she had begun. She should not do so, for, in so doing, she yields to a deception of the Devil. The moment she feels her mind disposed by My visitation, in the many ways I have told you, she should abandon vocal prayer; then, My visitation past, if there be time, she can resume the vocal prayers which she had resolved to say, but if she has not time to complete them, she ought not on that account to be troubled or suffer annoyance and confusion of mind; of course provided that it were not the Divine office which clerics and religious are bound and obliged to say under penalty of offending Me, for, they must, until death, say their office. But if they, at the hour appointed for saying it, should feel their minds drawn and raised by desire, they should so arrange as to say it before or after My visitation, so that the debt of rendering the office be not omitted. But, in any other case, vocal prayer should be immediately abandoned for the said cause. Vocal prayer, made in the way that I have told you, will enable the soul to arrive at perfection, and therefore she should not abandon it, but use it in the way that I have told you. And so, with exercise in perseverance, she will taste prayer in truth, and the food of the Blood of My only-begotten Son, and therefore I told you that some communicated virtually with the Body and Blood of Christ, although not sacramentally; that is, they communicate in the affection of charity, which they taste by means of holy prayer, little or much, according to the affection with which they pray. They who proceed with little prudence and without method, taste little, and they who proceed with much, taste much. For the more the soul tries to loosen her affection from herself, and fasten it in Me with the light of the intellect, the more she knows; and the more she knows, the more she loves, and, loving much, she tastes much. You see then, that perfect prayer is not attained to through many words, but through affection of desire, the soul raising herself to Me, with knowledge of herself and of My mercy, seasoned the one with the other. Thus she will exercise together mental and vocal prayer, for, even as the active and contemplative life is one, so are they. Although vocal or mental prayer can be understood in many and diverse ways, for I have told you that a holy desire is a continual prayer, in this sense that a good and holy will disposes itself with desire to the occasion actually appointed for prayer in addition to the continual prayer of holy desire, wherefore vocal prayer will be made at the appointed time by the soul who remains firm in a habitual holy will, and will sometimes be continued beyond the appointed time, according as charity commands for the salvation of the neighbor, if the soul see him to be in need, and also her own necessities according to the state in which I have placed her. It was for this reason that I told you that prayer was made in many ways, that is, that actual prayer may be united with mental prayer if made with the affection of charity, which charity is itself continual prayer. I have now told you how mental prayer is reached by exercise and perseverance, and by leaving vocal prayer for mental when I visit the soul. I have also spoken to you of common prayer, that is, of vocal prayer in general, made outside of ordained times, and of the prayers of good-will, and how every exercise, whether performed in oneself or in one's neighbor, with good-will, is prayer. The enclosed soul should therefore spur herself on with prayer, and when she has arrived at friendly and filial love she does so. Unless the soul keeps to this path, she will always remain tepid and imperfect, and will only love Me and her neighbor in proportion to the pleasure which she finds in My service."